Image: Texas Army National Guardsmen assist residents affected by flooding caused by Hurricane Harvey in Houston, Aug. 27, 2017. Army National Guard photo by Lt. Zachary West. New polling data provides some inspiring news about the prospects for climate change action in the United States. 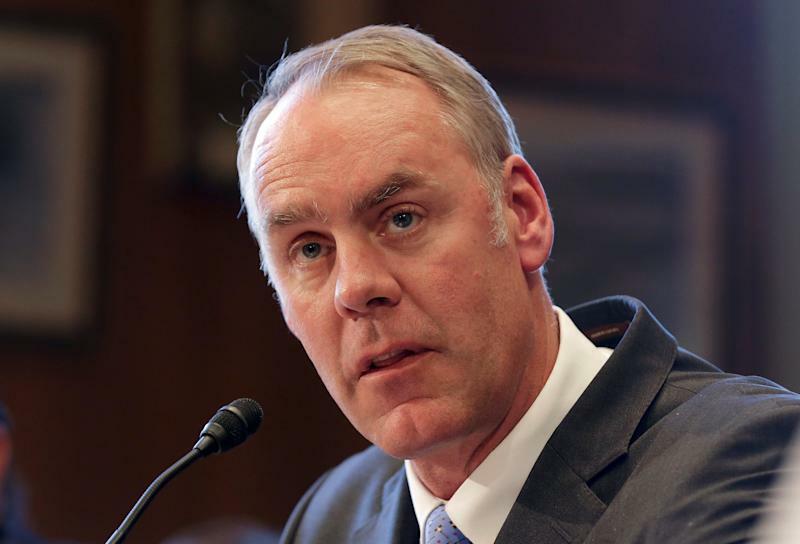 According to public policy polling conducted by AP-NORC and the Energy Policy Institute at The University of Chicago, 61% of American citizens believe that climate change is a threat that the federal government should actively work to prevent. The poll also reveals that majorities in both major political parties – Democrats and Republicans – accept the fact that climate change is actually happening and that human activity is making it worse. This data reinforces previous polling data indicating that a majority of American citizens, regardless of party affiliation, believe that climate change is a serious issue demanding urgent political action. What sets the new set of data apart from the rest is also the part that makes it slightly less uplifting. The poll found that 51% of Americans are willing to pay $1 per month to combat the growing threat of climate change, but when you start look at numbers higher than a dollar per month, the willingness of American citizens to foot the bill begins to decline sharply. Additionally, the poll found a majority of citizens are against fracking, especially when they learn about the negative health effects from the oil and gas drilling process. However, support for fracking rises to nearly 41% when citizens are told that it could save them a few hundred dollars each year on their electric bills. The new data helps to provide a clearer picture of how American citizens tend to view most non-social issues, and that is through the lens of finance. When presented with data showing that dirty energy is harmful — but might save them money (in the short term) — they gravitate towards the “saving money” rather “saving lives” side of the climate equation. But the fact that most people are willing to shell out even one dollar per month is actually a giant leap forward in terms of Americans’ willingness to address the growing threat of climate change, even if they may have to foot part of the bill. Another interesting point about these polls is that the data was actually collected prior to the devastating string of hurricanes that hit the US — Harvey, Irma, and Maria — that captured the attention of the public and brought the issue of climate change to the forefront, albeit for a brief period of time. There’s no doubt that the federal government could and should devote a lot more taxpayer money to fight climate change. Instead, Washington is currently choosing to subsidize an industry that is struggling to survive, and is significantly responsible for the climate change that’s hurting us now. Why Not Fund Climate Action With Polluter Profits? Ultimately, when it comes to paying for action to combat climate change, American citizens might consider asking their representatives in Washington to hold polluting industry responsible for funding the US response to climate change. After all, the fossil fuel industry bears significant responsibility for our current and future global warming predicament. A recent report found that subsidies to the fossil fuel industry top $5 trillion a year – money that could instead be spent on infrastructure to protect low-lying cities from flooding in the event of rising waters, for instance. That money could also be used to provide more subsidies to the renewable energy sector which is already growing at a pace that far exceeds that of the fossil fuel sector. Perhaps if we end the federal life support going to fossil fuel companies — a form of corporate welfare that is far from necessary — we could finally start addressing climate change without having to ask taxpayers to cough up a few extra dollars every month. This budget isn’t the newest problem SNAP has had to face. The number of people on SNAP ebbs and flows with the economy, but only 75 percent of people who are eligible for SNAP actually participate in the program, the website Snap to Health says. And it’s because applying can get really complicated. Evan Teske, a 26-year-old medical student, needed assistance while he was working for Americorps. After graduating from college in 2014, Americorps assigned him to Focuspoint Family Research Center, which focuses on education from childhood to adulthood. His stipend just wasn’t enough. “So I had to apply for food stamps,” Teske told Newsweek. The application process was pretty confusing, he said, but Americorps helped him apply. Then, after about a year and a half, he was taken off. Teske worked for Americorps for the next six months and then moved to New Mexico for medical school. He said SNAP and food stamps made his life more livable. Teske was taken off food stamps because his family helped him when he was needing a bit more. If Trump’s budget proposal passes the Senate, as it has already passed the House, many more people will be bumped off SNAP—and a lot of them won’t have the familial safety net that Teske did. But lately, for two big reasons, fewer people have been taking advantage of SNAP. First of all, the economy is doing better, which means fewer people are struggling with poverty and fewer people need the program. In 2009, about 32 million people received SNAP benefits. The number increased during the great recession to an annual high of 47.6 million in 2013. Then, as the economy began to improve, it was down to 43 million in April 2010. And it’s continue to show. From April 2015 to April 2016, it was all the way down by 1.9 million participants. “The unemployment rate has often been a pretty good indicator for the need for SNAP. As it comes down, there might be a bit of a lag, but we see SNAP come down,” Vollinger said. The second reason, however, is that some states are cutting corners by making it more difficult to apply for SNAP so they make more room in their budget. Moreover, some state laws don’t allow people to stay on SNAP for longer than a few months unless they have jobs, are training for jobs or are doing community service. But in times of economic stress, there aren’t always jobs available for them. Take, for example, Devon Bracher, who graduated from Vanderbilt with an engineering degree and was living with her two sisters in Portland, Oregon, when she applied to get on SNAP after not being able to find a job. So Bracher went through the online application for SNAP. But the system had her call a SNAP representative because she wasn’t a Tennessee resident. “I probably called maybe like five different times and the line was always busy,” Bracher said. Eventually, she just gave up. Not everyone has a family like Bracher’s, and if the proposed cuts to SNAP make its way through, the states will be responsible to keep families from starving. In Alabama, for instance, the number of able-bodied people on SNAP has dropped from around 5,000 to 800. Most of it is because of the regulations states are forced to place on the benefits so that they can make their budget, a trend that’s seen all over the U.S.
Californians have concerns people who need programs like SNAP won’t be able to access them under Trump’s new budget, according to Jared Call from California Food Policy Advocates. “We try to think of people first, but this particular [budget proposal] … would really seek to shift a substantial share to the states or propose penalties to put states on the hook and that’s just not something that state budgets are prepared to absorb,” he told Newsweek. One in six people in America faces hunger, more than almost any other country in the developed world. If this budget goes through, and important programs like SNAP are axed, that number will be on the rise. Story was updated to clarify the number of SNAP participants between 2015 and 2016 and the number of able-bodied people on SNAP in Alabama. Two decades ago, Australia took action on gun control after a mass shooting. That’s the idea behind the GravityLight—a lamp that only requires the weight of a bag of sand or rocks to provide light. And for the 1.3 billion people in the world who live in “energy poverty,” this simple yet genius idea could be a game changer. It basically works like a hand-cranked lantern. 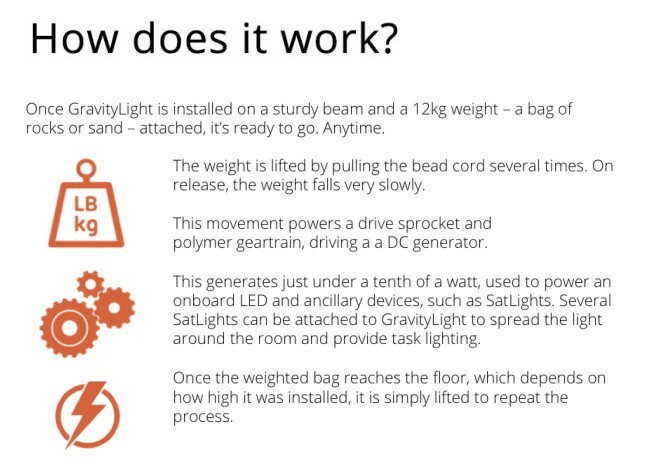 To activate the GravityLight’s bright LED, the user attaches a weighted bag that’s at least a 12 kg (about 26 lbs) to a beaded chain. The user then lifts the bag up by pulling on the chain. When user releases the bag, the bag’s slow descent to the floor (at about 1mm a second) helps power an internal DC generator that runs at thousands of rotations per minute. With these easy steps, the lamp can provide enough light for up to 30 minutes and can be repeated over and over as needed. This current version allegedly hammered out GL01’s kinks and is also brighter, simpler, lasts longer and stays lit even while it’s being charged, Gizmodo Australia reported. Three decades of data prove that tax cuts for the wealthy do not “trickle down” to working people or grow the overall economy. Since the Reagan era, Republicans have prescribed cuts for rich people and corporations as a cure-all. But every time they put their theory into practice, the rich just get richer and everyone else gets left behind. When such cuts drain the government of the revenue it needs to pay for essential services like public education, Medicare and Social Security, Republicans then seize the opportunity to shrink those programs. Similar experiments at the national level have left the U.S. teetering on the edge of dangerous economic inequality. Today, the top 1% of the population takes more than 20% of the income generated here in a year. That’s more than double the share that rich people took in the 1970s. Meanwhile, the earnings of America’s working families have stagnated. This degree of inequality is a major crisis, yet Republicans are proposing to exacerbate it by stripping trillions more in government revenue. Indeed, the GOP plan would put the country on a path to permanent economic inequality — and maybe that’s the point. Some members of the ruling class are making a concerted effort to expand the wealth gap. A gang of powerful interests, led by the Koch brothers, launched a campaign to build support for the tax overhaul before it even existed. The coalition of wealthy conservatives spent tens of millions to mislead Americans about tax cuts. They had to: As the president of the Koch-backed group Americans for Prosperity, Tim Phillips, recently said of the “average Americans” whose support would be needed: “If they think it’s just a group of wealthy corporations or powerful special interests battling it out to see who gets the best carve-outs, then it will fail.” If the coalition succeeded in obscuring the truth, in other words, its investments would pay off. This campaign illustrates why economic inequality poses a grave threat to democracy. In our political system, money is power. The more we allow Republicans to concentrate the lion’s share of wealth in the hands of a few, the more power these wealthy few will have. And they will use this power to continue rewriting the rules of both our economy and our political system in their favor. As a presidential candidate, Donald Trump promised to “fix the rigged system.” By “fix,” he apparently meant rigging it to permanently benefit billionaires like himself. Bullish investment in the American people has arguably been the most important factor in our national success. But out of greed and selfishness, Republicans are intent on fighting such investment at every turn. After accumulating nearly all of the economy’s gains over the last 10 years, billionaires like Trump, and me, can more than afford to pay our fair share. Let’s raise taxes on the rich and use the money to invest directly in the American people — by improving infrastructure, promoting clean energy, strengthening public education and expanding healthcare. Let’s boost wages to stimulate economic growth and job creation. It’s the only way we will create broad prosperity, rebuild the middle class and give working families a fair shake. At a time like this, there’s only one reasonable position to take: I’m a billionaire. Please raise my taxes. The danger and destruction of three high-category hurricanes within a week of each other on one side of the country, while wildfires and heatwaves racked the west coast should have woken up the United States — Climate change is real and the risks are growing. Seeing the devastation of those affected by extreme weather amplified by climate change leaves many of us angry and helpless. It also makes the recent regressive steps taken to continue our nation’s climate-changing fossil fuel addiction all the more frustrating. At the same time, it inspires my work as a leader of an organization that is helping D.C. stay focused on energy solutions. On October 5, we celebrate the second annual Energy Efficiency Day. Energy efficiency is not the most exciting way to reduce fossil fuel pollution, but it is the easiest. Energy not used reduces carbon emissions, while saving residents money. It also lets us redirect public resources to other causes like health care and public housing and local jobs. Less pollution, more savings — what’s not to like? We at the DC Sustainable Energy Utility (DCSEU) are supporting Energy Efficiency Day as a collaborative effort of scores of organizations, companies and government agencies to spotlight the best ways to manage the District’s energy demand. Our message is simple: Save energy, save money, reduce emissions. Lightbulb for lightbulb. In partnership with the District Department of Energy and Environment (DOEE), the DCSEU was born in 2011 with a mission to reduce the city’s energy use — and with it, pollution. That’s what we’ve done. Over the past six years, the DCSEU has prevented lifetime emissions of more than 3 million tons of CO2. This is equivalent to the greenhouse gas (GHG) emissions from 3 billion pounds of coal burned or more than 670,000 passenger vehicles driven for one year. Fewer greenhouse gasses means less warming, which reduces the risks from extreme weather events worsened by warming. D.C. faces a particular energy struggle: About 900 people move to the city every month — with population growth surging, energy demand is soaring. But we don’t have our own power plants. Nearby states generate most of D.C.’s electricity, and fossil fuels like coal, oil, and natural gas account for 60 percent of that mix. At the DCSEU we focus on energy efficiency because we know that it’s helping the District become more energy self-sufficient while creating new economic opportunities for District residents. Our rebate program makes energy efficient lighting and appliances more affordable and is part of our support for a more equitable energy future. Our Workforce Development Program is one way we are building this future, by training underemployed, unemployed and other job-seeking D.C. residents so they have the skills for the ever-growing green jobs market. Since 2011, we have helped the District, its residents, and businesses save half-a-billion dollars on their energy bills. And we are not done yet. But how can energy efficiency help you combat climate change by reducing your own carbon footprint? The answer is easy. You can start by switching your old incandescent or CFL lightbulbs to LED’s, which use 75 percent less energy. Buying a new washing machine? Consider picking one that’s ENERGY STAR-certified, which means it will deliver the same results as a standard washer — clean clothes — but will require 45 percent less water and 25 percent less energy. And it will show on your utility bills. Thanks to the U.S. Department of Energy’s Appliance and Equipment Standards Program. By 2020, a typical family with new appliances will be able to save an average of $500 per year. The total savings are estimated to accumulate to $64 billion annually as appliances become more efficient. While cities have become the main drivers in the transformation of the energy economy, everyone can take action. Today, I am asking you to reconsider your environment in a new light — whether home or business — and think about their energy choices. Small steps will translate into a larger transformation, lightbulb for lightbulb. Ted Trabue is the managing director of the District of Columbia Sustainable Energy Utility. Rogue Kite Productions with Michelle Antoinette Boley and Taylor Gill. Author John HannoPosted on October 6, 2017 October 6, 2017 Categories Health - Happiness, Injustice Anywhere is a Threat to Justice Everywhere, MLK jr, Labor and Working, Politics in America, Today's News?, VeteransLeave a comment on The Price of Freedom????? 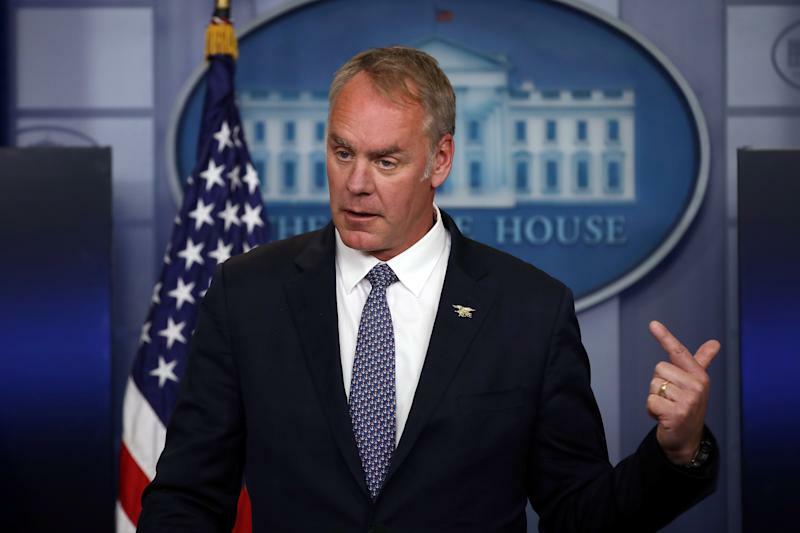 Secretary of the Interior Ryan Zinke speaks during a daily press briefing at the White House in Washington, U.S.
WASHINGTON (Reuters) – The head of the U.S. Department of the Interior came under further scrutiny on Thursday amid a media report that he had attended a Republican fundraiser in March during a government trip to the Caribbean.